There’s nothing quite like the Ouija board. Nothing can give you the thrills and scare your pants off like this game. In the 19th century almost everyone used to believe in ghosts. The short life expectancy back in the days along with conflicts like the Civil War surely had a major role in making people want to desperately communicate with their lost loved ones. The advertisement for the board first popped up in 1891, claiming it to be the most interesting, remarkable and mysterious production of the nineteenth century. Novelty stores in Pittsburgh started selling them for $1.50. It became popular soon enough as teenagers started playing it during sleepovers. While with friends, you would place your fingers on the planchette and ask a question. The planchette starts moving from letter to letter according to the questions answered. The Ouija board consists of a flat ‘talking board’ and a teardrop-shaped planchette. The letters of the alphabet and the numbers from 0 to 9 are neatly arranged on the surface of the board with a ‘yes’ and a ‘no’ in the uppermost corners. Apart from that, it is has the sun in the left, representing light, and a moon in the right, representing darkness. The pentagram on the middle of the board represents the five elements. At the bottom of the board is the word “goodbye’’. Some of you might know the basic characteristics about the board. Well, here we give you 10 strange facts about the Ouija board that you probably never heard of. A Pittsburgh toy and novelty shop called Danziger’s & Company first advertised “the wonderful talking board” and described it as “without a doubt, the most interesting, remarkable, and mysterious production of the nineteenth century,” according to a newspaper from the time. They offered it for the low, low price of $1.49. According to the man who acquired the patent for the board game, the name for the spirit board was apparently given by the board itself. The story goes that Elijah Bond, the man in question, sat with the board with his sister-in-law, and asked the board for naming advice. The planchette (the small piece you put your hand on) guided them to spell “Ouija”. When asked what did that mean, the board answered, “Good Luck”. The science behind the concept of the Ouija board is called the Ideomotor Effect. Ideomotor actions are unconscious and involuntary movements led by the subconscious. Place the board upon the knees of two persons, lady and gentleman preferred, with the small table upon the board. Place the fingers lightly but firmly, without pressure, upon the table so as to allow it to move easily and freely. In from one to five minutes, the table will commence to move, at first slowly, then faster, and will then be able to talk or answer questions. The letters and numerals forming words and sentences will appear in the glass opening lens of small table. Most players ignore the rules of the board. We are all curious creatures of this planet. We always look for unique experiences and sometimes our curiosity makes us jump into the pool before reading the rules. The Ouija board has its own set of rules that we are supposed to follow. Ignoring these rules has serious consequences. Some people believe that, by not playing by the rules we are opening the doors to evil. Three of those rules are considered to be the most important. They are “never ask the board when you are going to die, never play alone, and never talk about God”. For such a world-famous board game, the origins are mysterious. Nobody can actually confirm with any proof the true origins of a spirit board. There are numerous theories abound, of course, but none with actual evidence. Ouija boards have been linked to automatic writing, where mediums claim to have written down messages from spirits. Others have linked the board to ancient Chinese writing devices, or Pythagoras, who was said to have created similar boards back in 540 BC. None of these theories has any real evidence. During World War I, almost every household in the US had a Ouija board. In 1922, Ouija board sales even outsold Monopoly. In 1920 alone, three million Ouija boards were sold. In 1922, it even outsold Monopoly. At one point during this revolutionary rush, nearly every household in the USA had one either stashed in a cupboard or displayed on a coffee table. Whereas most people perceived and played Ouija as a simple and innocent game, others used it to communicate with dead loved ones and otherworldly spirits. People were mesmerized by the product and willing to open up their wallets. The game was sold all over the country, mentioned in numerous news articles, and often featured in films. The movie ‘The exorcist,’ stopped the nation-wide Ouija fad dead in its tracks, resulting in many people destroying their Ouija boards in fear. In the 1973 film The exorcist, a 12-year old girl named Regan MacNeil becomes possessed by demons through a Ouija board. Since almost everyone in America had access to a Ouija board at the time and most had a history of playing it, the events portrayed in the film ignited a widely-spread fear of the ‘true’ nature of the Ouija board – labeling it a gateway to hell and a tool of the devil. Even today, the board is still believed by some to be far from harmless, and that it’s is not a simple board game that marketers claim it to be. Needless to say, after the release of the film, many people destroyed their Ouija boards and sales plummeted. Even though the sales of these boards took a huge hit during the time, and subsequently developed a stigma, the controversy surrounding it drew in new buyers. 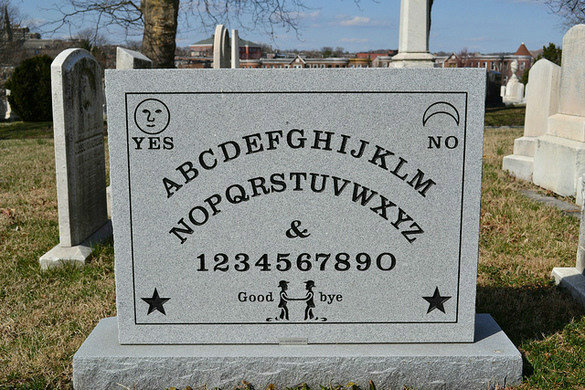 An Ouija Board tombstone was made for its creator. Elijah Bond, the creator of the game was a lawyer and inventor. He patented the Ouija board in 1891 after leaving the patent officer in shock. He then went on to hire William Fuld, who later became the face of the company. While alive, Bond never received the recognition he deserved. In 2007, an Ouija board collector and Historian, Robert Murch, paid tribute to Bond’s invention by erecting a Ouija board gravestone in his name. On his death bed, Ouija board manufacturer William Fuld uttered the words ‘never sell the Ouija board,’ to his children. William Fuld, a man who’s best known for the marketing and manufacturing of Ouija boards since the 1890s, died after falling from a newly erected Ouija board factory in Baltimore, USA. Fuld is said to have blamed his death on a spirit he channeled through his Ouija board, who consulted him to ‘prepare for big business.’ Fuld was then rushed to hospital after breaking several bones in his body. He died later that same day from a punctured heart. While lying on his deathbed, Fuld made his children promise to never take part in the selling of Ouija boards, since he believed it to have played a supernatural role in his death. DUMBEST THINGS HUMANITY HAS EVER CREATED THAT ARE STILL IN ACTIVE USE !